Concordia* is a highly regarded middle weight euro game, released at Essen in 2013 (and reviewed by me in 2014). As is typical of Mac Gerdts designs it features quick, snappy turns – but you always have tough choices to make. The key to success is efficiency and tactical nous, as well as long term strategic planning. But unlike most of his games it doesn’t have a rondel, instead employing a clever take on deck building. It’s not a big part of the game: you start with eight cards and will end up with about double that. But each card you end up with will multiply a particular way to score. This really rattles your brains and for me makes Concordia a classic: to win you need to follow the strategy that the cards you’re buying suggests – perhaps spreading into lots of territories, or making sure you have all of your colonists on the board by the end. But you can also afford to deviate from that plan when great opportunities present themselves. What does Salsa bring to the party? 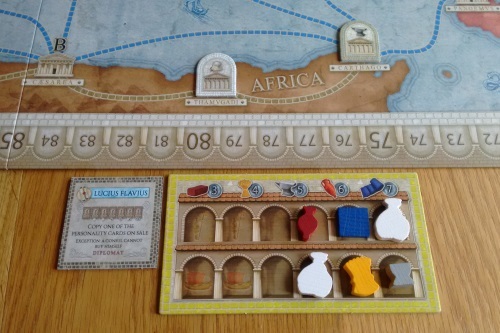 Concordia Salsa is in three parts, or modules; each of which can be used independently of the others and in any combination with the base game (or the first expansion, ‘Britannia & Germania’). You get a new double-sided board, a new commodity and new ways to personalise your strategy with the forum tiles. The two maps add variety, but little else (they don’t offer any new mechanisms in the way the Germania did, for example). The Hispania side is a tight map good for two to three players, while Byzantium is more expansive. Both offer some interesting challenges in particular situations, with some tricky to navigate destinations. The new commodity, salt, is essentially a wild resource. It’s super useful as it replaces any resource, but cities are expensive to build (a wine, a tool and five sestertii) and you can’t sell it directly for cash. On the plus side, each salt city counts as a type of your choice for Minerva scoring, as well as for provinces and as non-brick cities. Forum tiles add more personalisation to the game. There are 27 tiles (14 green, 13 blue) in the box, with each player starting with a blue one and then collecting another one each time they ‘tribune’ (as long as they’ve picked up at least four cards, including tribune, from their discards). So you’ll probably see about four or five each per game. Blue forum tiles give you a permanent advantage for the rest of the game, so are great to take early on. Examples include giving you four extra storage spaces; being able to trade three goods types instead of two; or getting one additional sestertii for every good sold. Green forum tiles are one-shot advantages, which can be useful at any time. These range from getting a free salt or five victory points, through to one-off cheap buys such as up to four food for just two sestertii each, or a salt city for just one wine (so no cash or tools). How much does it change the game? The forum tiles are the real game-changer. It seems to be traditional for successful euro games to add this level of ‘starting player powers/ differentiation’ (that is so popular in ameritrash base games) as an expansion and I for one welcome it. Here though, it’s relatively subtle. Most abilities slightly enhance things you’d always be doing anyway and though it may slightly change how you play each game it isn’t Marco Polo-style changes that almost force you down a path if you’re going to take advantage of them. If I have a complaint, it’s how you get them. At the start of the game each player takes one of two they’re dealt (which is OK – and there is an auction variant), then throughout the game you have a forum board to take from. The more cards you tribune the more choice you have – 4/6/8/10 cards gives you 1/2/3/4 choices respectively. I’m sure some players will see this as just another level of unwelcome randomness. The new maps add subtle differences that I welcome, but that I could also live without. I’m not someone who plays this type of game into the ground, so don’t ‘need’ that level of variety yet. Personally, I see these as being on-par with than the original maps – not better or worse. As for salt, it is easy to go a whole game and totally ignore the salt cities and not be at a disadvantage. That said, taking a salt city or two early – and taking the right strategy with them, especially with certain forum tiles – can be a powerful combination. Choosing whether to go for them is another decision, and this kind of game is all about decisions, so overall I welcome the extra tactical and strategic challenge. Is Concordia Salsa value for money? If you thought the original Concordia was value for money at around £40, I don’t think you’ll complain about Salsa at £25. The box is the same size as the original game’s and almost as full; what with the main board, forum board, wooden salt pieces, salt city tiles and forum ‘cards’ (which are actually nice thick two-inch-plus cardboard squares). I baulked at paying £15 for the earlier map-only expansion (Britannia/Germania) and am glad I did – if you only buy one expansion for Concordia, I would certainly suggest this is the one to go for. The extra £10 is getting you some genuine additions to the game and the production quality is excellent (although the jury is out on the box cover…). What I don’t think Salsa will do is convert any naysayers. While the forum tiles especially add an extra dimension to play they don’t take the game in a different direction; instead just enhancing what was already there. For example, I can’t see anyone rejecting Concordia on the basis of starting setup, as players quickly diverge anyway. The answer to this isn’t cut and dried and I’d suggest it depends on both the amount you play and your style of play. If you play Concordia a lot and love it, you probably have this already – and if you don’t, I’d highly recommend it. The maps, the salt and the forum tiles are all interesting new aspects for a seasoned player to enjoy. However they won’t be for everyone. The original game has an elegance that the forum tiles especially get in the way of, watering down the purity of the design and adding more random elements – as well as more things to try and follow as you attempt to judge what your opponents may do. I don’t buy criticism of salt making the game easier though, as it is so expensive to get the cities going in the first place. If you’re still happy exploring the base game, you can afford to knock yourself out with it and hold off – unless you’re a big fan of unique starting situations. Salsa cleverly adds that and does so with little new rules overhead, so you may well want to invest. … and does it fit in the original Concordia box? Yes! Just… With the original insert still in the box the lid won’t quite close, but you’re only talking a few millimetres. If you take the insert out completely (I’ve been reliably informed – thanks!) you can cram the original expansion in there too. * Thank you to PD Verlag for providing a discounted copy of Concordia – Salsa for review.